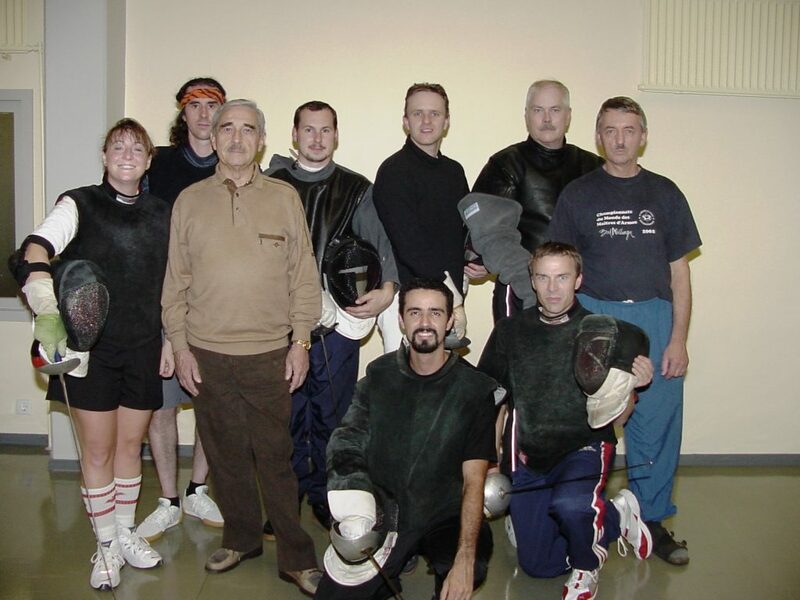 Students and faculty of the 2005 Academie d’Armes Internationale Maitre Course at Bad Karlshafen – the source of the 5 Minute Lesson taught in Salle Green. Third from left is Maitre Marcel Henri Dubois, then President of the AAI; farthest right is Fechtmeister Mike Bunke, a subsequent President of the AAI. At each Open Fencing session our coaching staff offers short, high intensity lessons concentrating on the lesson topic of the week covered in the Salle Blog. These lessons are structured on the model of the 5 Minute Lesson used in courses by the Akademie der Fechtkunst Deutschlands , derived from the lessons originally proposed by Fechtmeister Horst Heldt and developed and taught by Bundestrainer Emil Beck at the Tauberbischofsheim national fencing training center. Maitre Green learned the 5 Minute Lesson model at the Academie d’Armes Internationale Animateur-Moniteur-Prevot-Maitre Course at Bad Karlshafen in 2005, and from that developed the 3 Minute Lesson. Focuses on developing and training in one specific action, using the full range of appropriate footwork. Builds up the components of the technique, and then concentrates on executing as many repetitions as possible in the lesson time period with progressively more complex footwork. Only corrections are those critical to execution on the technique. Student should come to the lesson already knowing the basic execution of the skills needed. Focuses on tactical use of one technique and the counter to that technique in continuous movement over the 3 minute period. Minimum build-up of the technique with actions needed to create the tactical conditions for the technique to be applied. Corrections are by the coach defeating incorrect executions. Emphasis on a silent lesson to the greatest extent possible. These lessons are available at Sunday and Tuesday Open Fencing on a first-come first-taught basis with any available instructor. By appointment they are also available before the first evening lesson each day and after the last lesson of the day with Maitre Green. Fencers wishing a lesson before the first class of the day should arrive and be ready on the fencing floor for the lesson 15 minutes before the scheduled start of the class. Eight pack of lessons – $20.00. After the second 8 pack purchased, and each subsequent 8 pack, fencers are eligible for a bonus lesson at no charge.